Can a Nook Kill a Kindle? Aside from being a self-confessed iPhone addict, another gadget that fascinates me is e-book reader. Well, I should be. After all, I am a librarian by education although I admit I’m not really fond of book reading. I’ve seen, touch and used the Amazon Kindle and was in fact pretty excited about the Kindle International version. In fact, I’ve been thinking whether I should order one but suddenly that has changed. Thanks to the just announced Barnes and Noble e-Book Reader – the Nook. Now, why would I suddenly abandon my desire to own the Kindle because of the Nook? For the simple reason that the Nook outdates the Amazon Kindle. 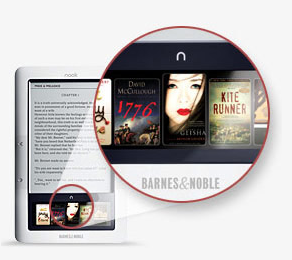 The Nook e-book reader supports full-color touchscreen features. Two important aspects that I’ve been looking for an e-book – colored and touchscreen. Two important aspects which the Kindle do not have. Plus of course, the Nook e-book reader also has some other nifty features including – Wi-Fi and 3G connectivity, direct access to Barnes and Noble online e-bookstore, 2GB memory storage and e-book sharing. The Nook goes for $259 which is a little less expensive than the current model of the Amazon Kindle. Now tell me, wouldn’t the Nook kill the Kindle? Not for me. I’ve had a Kindle 2 for about 6 months, and I am really fond of it. Of course it has pros and cons – what doesn’t? About gadgets: I knew when I bought the Kindle it would soon be outdated by a new, shinier better e-reader. Sure enough Kindle DX was released within weeks after I had mine. As much as we would like, we can never keep up with gadget technology. I look forward to the book wars that seem inevitable. I am a reader, and the Kindle is a blessing when I travel. Interesting points there Hal. I’ve always wanted to go into e-book reading. The Amazon Kindle was a cool idea when it came out but international availability was not possible back then. Then Amazon announced the Kindle International version, but was immediately pre-empted by B&N’s Nook. Now, I’m most probably be getting the Nook over Amazon. Exciting times ahead of the e-book industry indeed.